The Rangers are slumping, badly, and a breakout performance is desperately needed before they head out on a three game road trip. 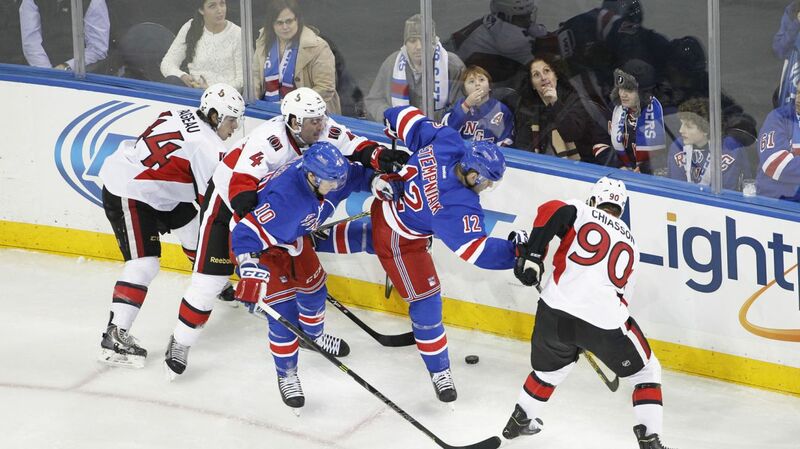 The Rangers (17-7-3) will take on the Ottawa Senators (14-7-5) for the second of three games this season. New York took the first game in a shootout, 2-1, back on November 14th, with Chris Kreider scoring the lone Rangers goal. The Blueshirts enter having won five of their last seven games against Ottawa. After a nine game win streak early in the season, the Rangers have not been nearly as effective, posting a 3-5-1 record in their last nine games, as well as a 1-4-1 mark in their last six. The defense hasn’t been strong, the goal scoring department is starting to dry up, and their analytic numbers are beginning to regress towards normal. On the other hand, the Senators have been playing very well as of late, winning six of their last eight games, including wins in their last two games. Their 3-2 overtime victory over the Islanders last night came at a cost when they learned that Kyle Turris, who has posted 22 points (11-11-22) this season, will likely miss some time with a leg injury. 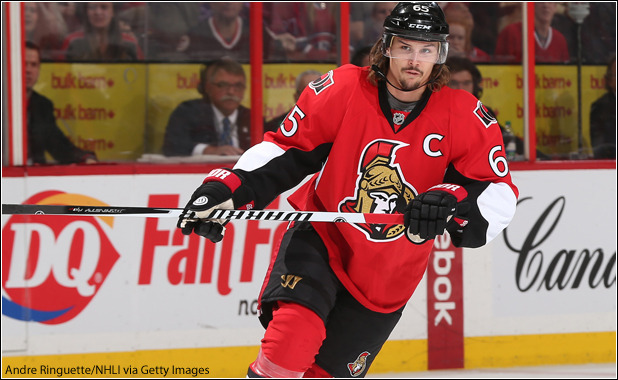 Erik Karlsson continued his fantastic start of the season, scoring the game winner in overtime to give him 32 points (6-26-32) this season. Mike Hoffman is on a tear as well, scoring another goal to give him 14 on the season, as well as extending his point streak to seven games (9-3-12), and a total of 17 points (10-7-17) in the last 12 games. Photo courtesy of Andre Ringuette/NHLI via Getty Images. With Andrew Hammond still sidelined with an injury, Craig Anderson is expected to make his 11th consecutive start. Anderson made 29 saves last night for his 12th win of the season. Henrik Lundqvist will be in net for the Rangers, and I expect him to be extremely focused and ready for this game. Henrik is 1-2-1 in his last four games, allowing an uncharacteristic 13 goals against in that span. Expect him to be much better tonight. Alain Vigneault shuffled up the lines for today’s game, and the biggest change comes with the top line center. Instead of Brassard centering Rick Nash, it’ll be the rookie Oscar Lindberg getting that opportunity next to Nash and Chris Kreider. Lindberg has been one of the more consistent players on the team, tied with Nash for third in scoring with 17 points, and sitting in second on the team with 10 goals. He’s been good, and now he’ll finally get the increased minutes that he deserves. Mats Zuccarello has been quiet lately as the team stopped their torrid scoring pace, but he’s been good against Ottawa in his career. Zuccs has three multipoint games in his last five games against the Senators, with six points (3-3-6) in those games. With Brassard and Hayes on his line, this could turn into a very strong trio. New York has earned a point in 11 of their last 14 home games (10-3-1), and they lead the league in wins (11) and points (23) when playing on home ice this season. Another win tonight would be huge to start turning things around. 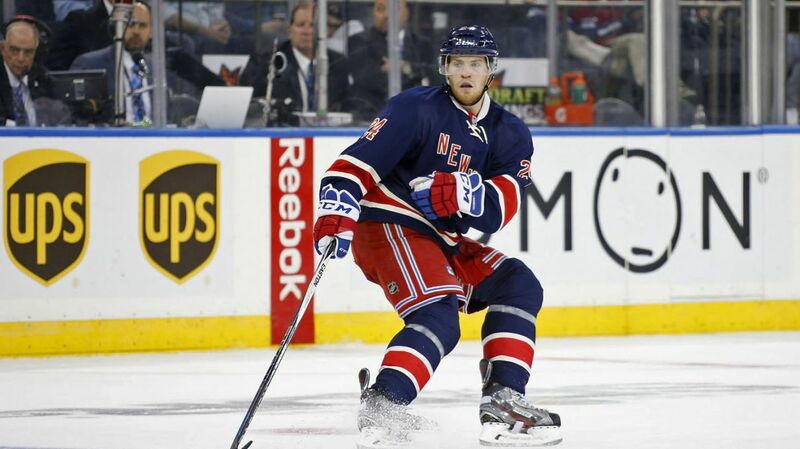 The Ranger and the Senators will face off at Madison Square Garden at 7 PM. The game will be broadcasted on MSG Network. Posted on December 6, 2015, in Game Previews and tagged Alain Vigneault, Antti Raanta, Chris Kreider, Craig Anderson, Dan Boyle, Dan Girardi, Derick Brassard, Derick Stepan, Dominic Moore, Dylan McIlrath, Emerson Etem, Erik Karlsson, Henrik Lundqvist, Jarret Stoll, Jesper Fast, JT Miller, Keith Yandle, Kevin Hayes, Kevin Klein, Madison Square Garden, Marc Staal, Mats Zuccarello, Mike Hoffman, MSG, New York Rangers, New York Rangers blog, NYR, Oscar Lindberg, Ottawa Senators, Rangers, Rangers blog, Rick Nash, Ryan McDonagh, Stepan injury, Viktor Stalberg. Bookmark the permalink. Leave a comment.